France has a very small population in relation to its size (around 120 people per km2 as opposed to the UK which has 265 per km2). 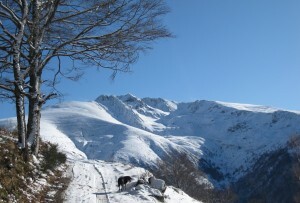 It’s no surprise then that it’s not hard to find some cherished peace and quiet in France in the winter. What’s more, the countryside is particularly beautiful when covered by a coating of frost or snow. I love nothing more than to wrap up warm and head out for a stroll along frosted paths with the dog. I am not much of a skier but I simply love snowshoeing. The sport isn’t expensive (you need very little equipment) and you can hire the gear from many sports shops in France if you don’t have your own. Snowshoes really are one of the best ways to explore the countryside and the mountains after a fresh fall of snow. 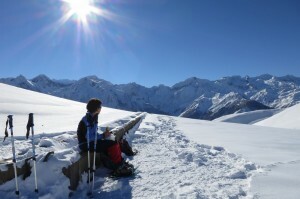 I have had some incredibly special, moving moments snowshoeing in France. The sheer beauty of snow-laden trees under clear blue skies, that special quietness and stillness that accompanies a snowy landscape, the clean, fresh, chill air, not to mention the feeling of wellness that you get after some good exercise. If you haven’t tried snowshoeing, you really must! One of my favourite, self-indulgent pleasures after a day of exercise outside in the chill winter air, is a mug of proper French hot chocolate, sipped slowly, whilst warming my toes in front of the woodburner. That luxurious creaminess that typifies ‘proper’ French hot chocolate? 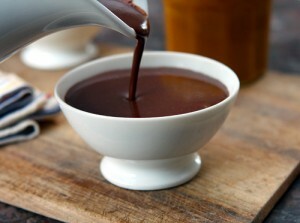 It comes from the addition of real, bittersweet chocolate stirred or blended into hot milk. Delicious and totally synonymous with France in winter. 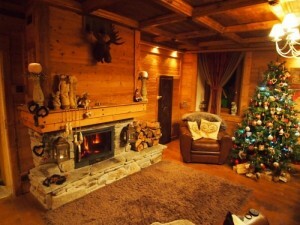 The French, especially those that live in the countryside, tend to use wood to heat their homes in winter. Traditional farmhouses have big open fireplaces in which metre long logs are burnt. Most other properties in the French countryside rely on woodburners to provide the heat in wintertime. Whatever the woodburning method, the unmistakeable aroma of woodsmoke in the air is the surest sign that winter is here. To me it’s such an evocative smell, conjuring up cosy evenings curled up on the settee, hot chocolate in hand, thick curtains drawn whilst fresh snow falls outside. Perfect. The French do wholesome, nourishing and warming food so well and it really does go down a treat on a cold winter’s evening after a day in the fresh air. The mountainous areas showcase some of the best hearty dishes in the whole of France. Discover the waist-expanding ‘tartiflette’ from the Savoie region of the French Alps (a hearty potato gratin with onions and bacon covered in melted Reblochon cheese). Make room for the world-renowned ‘cassoulet’, a filling and delicious stew made with beans, meats and sausages from the SW of France and the Pyrenees. But my favourite has to be the good old ‘pot au feu’. This slow-cooked casserole originates in French farmhouse kitchens where the cooking pot was suspended over the logs in an open fireplace where it would slowly cook away all day. Tougher but cheaper meat cuts turn into fall-apart, delicious mouthfuls on your plate. Good chunks of bread mop up the juices wonderfully! A visit to one of the numerous spa towns that you will find in the Alps, the Auvergne and the Pyrénées is a great way to recover from a day on the slopes or even after a good winter walk. Slipping into those balmy thermal waters in a modern spa centre is a very self-indulgent activity. The French spa centres are modern, well-equipped and have an impressive range of facilities for you to choose from. 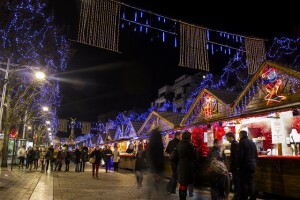 From the end of November through into the New Year, Christmas markets pop up in towns and villages throughout France. The French have got the art of the Christmas market down to a tee and succeed in creating a wonderful festive atmosphere with their chalets selling local produce, street entertainment and of course their legendary vin chaud. If you are normally of a ‘bah humbug’ disposition, visit a French Christmas market this Christmas and you may come away with a different opinion. You may not know this, but the French make more of a celebration of New Year than they do of Christmas. New Year’s Eve is called le Saint Sylvestre and is when the biggest parties are held and the finest food is served. 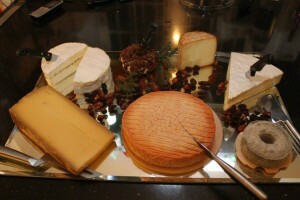 Yet another reason to love France in winter! The New Year’s Eve meal is called le Réveillon and usually features Champagne, oysters, foie gras, smoked salmon and fine cheeses. It’s a real gourmet’s delight. Although I love all manner of French patisserie, I always look forward to the galette des rois or the king cake which starts to appear in French bakers’ windows around Christmas. Traditionally associated with the Epithany on the 6 January, this puff pastry cake is usually filled with frangipane, a cream made from sweet almonds, butter, eggs and sugar, although chocolate, apple or candied fruits are becoming more common. 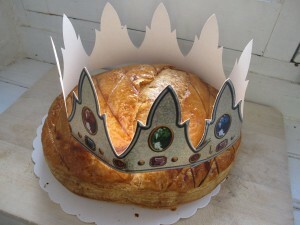 A small charm or ‘fève’ is usually hidden inside and whoever finds it in their slice is crowned king or queen for the day. 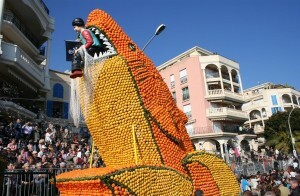 The lemon festival in Menton, Provence, is a unique event which lasts for 15 days and, for me, heralds the beginning of the end of winter. It takes place during the last 2 weeks of February and is a noisy, colourful event centred around all things citrus. It never fails to lift the spirits. This is why I love France in the winter. And you?